Bull dust in Kenya's South Rift ValleyThree thousand miles through Tanzania and Kenya: An impeccably prepared and kitted Land Rover 110 300Tdi, loaned to us by Shaw Safaris in Arusha, carried us across a major portion of Tanzania in a quest for three goals: potential safari routes for future trips with guests, new opportunities for ConserVentures to support small, community-based conservation projects, and the delivery of donated equipment to the South Rift Game Scouts. Through a bit of persistence and some nearly unbelievable synchronicity, we succeeded in all three. From Whistling Thorn Camp, on the border of Tarangire National Park, we headed south on a difficult two-day drive over rough dirt Tanzanian B-roads: corrugated, stony, booby-trapped with the odd bumper-deep pothole. We stayed at a modest but comfortable camp outside Ruaha National Park, and spent a day there spotting leopards and watching some of the park's 8,000 elephants - the largest population in East Africa. Then southwest on the runway-smooth TanZam Highway to Mbeya, where we discovered the improbably named Sombrero Hotel - as Arizonans how could we resist staying at such a spot? The next morning we took a chance on a map reference and had breakfast at a beautiful coffee plantation, one of the oldest still working in the country. The owners, when we told them of our planned route, insisted we needed to stay at a lodge owned by acquaintances on the shore of Lake Tanganyika, which sounded just okay with us. Another long, rough day's drive landed us there in time for dinner on the shore, with Venus reflecting off the water. And the next morning we met Howard. Lake Shore Camp, Lake TanganyikaHoward introduced himself to Roseann by saying, "I recognize your voice." A brief investigation revealed that Howard's parents were on the board of directors of the Sky Island Alliance in Tucson, of which Roseann had been the executive director for several years, and that she and Howard had actually spoken on the phone several times - about 17 years before . . .
More importantly, it developed that Howard, now living in Arusha, had started a tiny conservation organization devoted to helping researchers and local students gain access to books, web information, and government resources not easily available to most residents. Ensconced in a donated office and supplied with a motley collection of laptops, it's nothing less than the perfect expression of the type of effort ConserVentures plans to assist. After an obligatory pilgrimage to Ujiji and the homely, rundown, but oddly charming memorial to the meeting of Stanley and Livingstone, we drove to Katavi National Park and spent two days wandering this completely undeveloped refuge, spotting at one point a herd of at least 500 cape buffalo, and spending one night half-awake while hippos performed a Fantasia-esque dance around our tent. Another two days brought us to Lake Victoria, near where John Hanning Speke correctly if completely without evidence decided that it was the source of the Nile River. Skirting the western edge of Serengeti, and driving through the stunning Mara River delta, we crossed into Kenya and, after picking up the overstuffed duffel we'd left with friends in Nairobi, headed south to the South Rift Resource Center, a research camp owned by a women's group of the Olkiramatian Maasai community, for which Roseann had helped raise funds. The resource center sits in the middle of stupendous wildlife habitat despite being nowhere near a national park - one of the best examples of community conservation in Kenya. Here we met the South Rift Game Scouts and handed over the equipment we'd brought, after a thorough familiarization session. The Sierra Designs tents will shelter the scouts on field excursions during the rainy season, the binoculars will help them spot game and poachers at far greater distances than even their acute vision would otherwise allow, and the GPS units will help pinpoint game trails, herds, and, when necessary, carcasses to plot the geography of poaching in the constant effort to reduce its impact. Also included was a PowerFilm solar AA battery recharger. We told the scouts that we plan to follow up on the condition of the gear next year; if it's in good shape we'll add to the inventory. This is one way we hope to promote a sense of pride and responsibility in the group, rather than simply being viewed as a bottomless pit of funding, an all-too-common fate of so many larger conservation organizations. All in all, we couldn't have hoped for a more successful outcome. 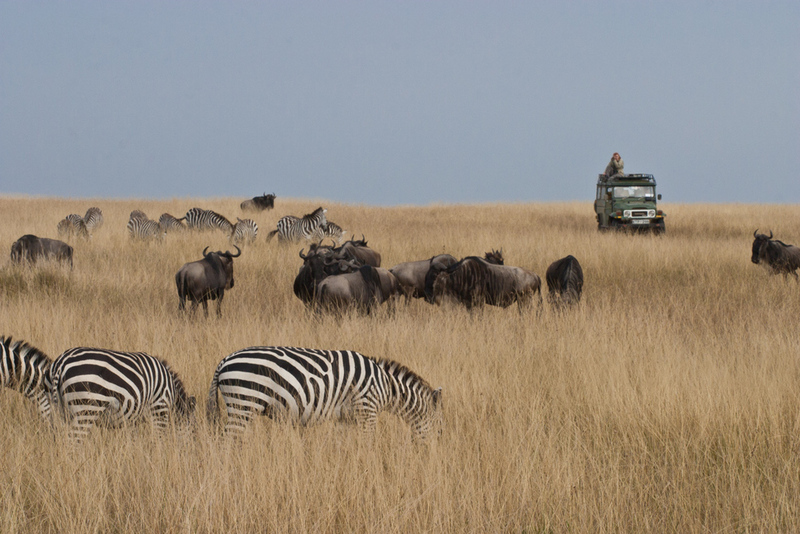 As to the possibility for future safaris with guests - that, too, was successful. Watch this space if you've always wanted to experience Africa, but don't fancy winding up in a zebra-striped minivan with a dozen photo-vested tourists . . .